Take a Little (Water) Pressure Off - All Pro Plumbing, Inc. Yes, it’s nice having powerful water pressure for things such as dishwashers or showers, but the reality is, high water pressure puts extra strain on your pipes and can wreak havoc on your plumbing system—not to mention ceilings, walls and floors if a leak occurs. It also puts additional stress on appliances such as your washing machine and water heater. Over time, even pinhole leaks can cause expensive damage. Excessive force can cause pipe joints to break, valves to leak, and over time cause toilet parts to succumb. High water pressure also wastes water, and what you may not know is that many municipalities not only charge for water consumption, but also for the disposal of wastewater. Reducing water consumption also reduces the excess energy needed to heat the additional water- hence, more money in your pocket. There are a number of indications your pressure is too high. Typically you will hear banging somewhere in your pipes, or you may have leaks in fixtures that only appear intermittently, such as at night. Another indication is when toilets start running when they are not being used. There are a few reasons your water pressure could be higher than needed. One of the major causes comes from the municipal water supplier, who can often set the pressure to meet their own needs such as delivering water to fire hydrants or high elevation buildings. These are often set over 100psi, and too often over 150psi. For a residential home, the maximum should be 80psi. Living at the bottom of a hill is another common reason for high water pressure. Fortunately, the solution is simple. A water pressure reducing valve automatically reduces the pressure from the water supply to a slower, more sensible pressure. 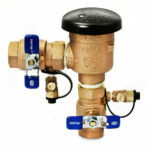 The valve is installed directly after the water meter and even if the supply water pressure fluctuates, the pressure reducing valve ensures a constant flow at the set pressure. There are different types of valves, along with different installation configurations, so if you are inexperienced in plumbing, this is a job that is best left to a professional.